If you are getting married and going on a honeymoon this year, it is important to start booking your flight and hotel as early as possible to get the best deals. Most wedding planning timelines recommend that you start booking things for your honeymoon about 6 months before you plan to leave on vacation. If you are choosing Hawaii as your romantic honeymoon destination, these islands will most definitely not disappoint! Each island offers a unique landscape and different vibe so the first step is choosing which Hawaiian island you want to spend your time on. Use this guide to help you narrow down your options and plan the most amazing honeymoon ever. The Hawaiian islands are a great honeymoon destination. They are a remote, tropical paradise. Each one of the Hawaiian islands is unique and offers distinct experiences. Because each island is unique, it can be helpful to know what each island offers so you can pick the best choice based on your interests. If you choose to travel to Maui for your honeymoon, you will find that there are a lot of resorts to stay at. Many of these hotels and resorts are located in and around Ka’anapali. Maui has been voted the best island in the world many times. This island is the perfect spot for a romantic vacation where you can soak up the sun and have an adventure. You should plan on getting a rental vehicle on Maui so you can make the most of your trip. The alternative choice to renting a car is choosing guided tours that offer hotel pickup and drop off such as Skyline Hawaii’s Road to Hana tour or Skyline Hawaii’s Haleakala National Park sunrise tours. Big Island, or Hawaii Island, is the largest of all of the Hawaiian Islands. When you visit this island you will find lots of amazing beaches (like most of the other Hawaiian islands) along with many land and water adventure opportunities. 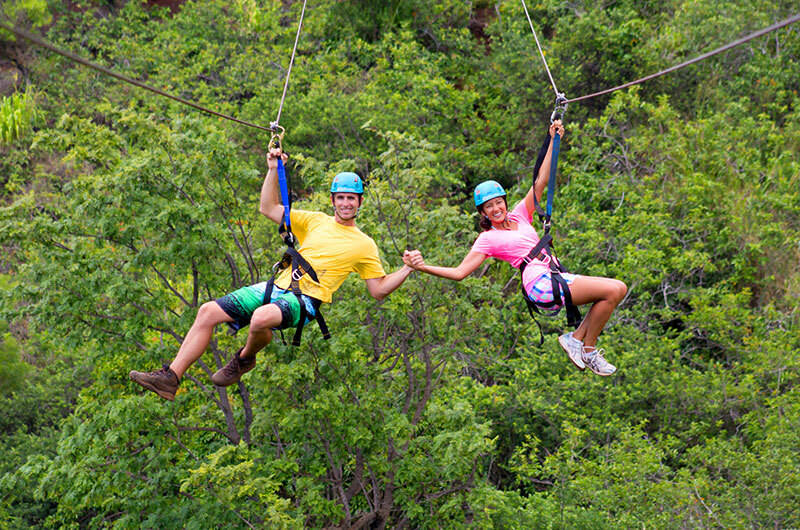 A romantic way to spend time on your honeymoon is ziplining over breathtaking waterfalls while on Big Island. This unique experience is a once in a lifetime opportunity. Kauai is the lushest and greenest island of the Hawaiian Islands. This is a very popular island for destination weddings because of how beautiful it is. You could have your wedding and honeymoon on the same island! In fact, you could even get married at the bottom of a waterfall! This beautiful island has a few popular resorts that you can check out if you are interested in staying here. They also have a very popular waterfall helicopter tour on Kauai that will fly you over waterfalls so remote that a helicopter is the only way to even see them. After picking which island you would like to spend your honeymoon on, the next step is narrowing down the things you want to do while you are there. There are a few things to think about when building and narrowing down this list including activity costs and time requirement. You will also want to set aside some down time to just relax and take in the fact that you just got married. So don’t book up your whole vacation schedule right away. You could go on a zipline adventure with your new spouse and take in all of the incredible island views together. Skyline Eco-Adventures has zipline adventure tours on Maui (in Ka’anapali and Haleakala), Big Island (near Hilo), and Kauai (near Poipu). Each tour is unique. You will laugh a lot and make memories that will last a lifetime! Can you think of anything more romantic than welcoming a new day on the top of a mountain? Watching the sunrise on the top of Mt. 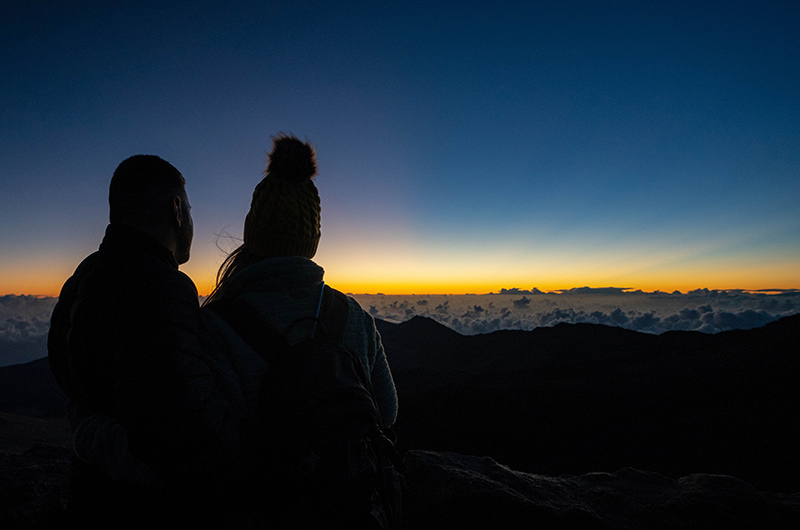 Haleakala is the number one thing to do on Maui for a very good reason. You won’t want to miss this opportunity to watch a one of a kind sunrise with your sweetheart. Exploring the iconic Road to Hana is another must-do while on Maui. There are so many things to do and see on this amazing tour! Beaches, waterfalls, ocean views, rainforest views, and even some hiking are a few of the things you will get to experience on this all-day tour. We recommend opting for a guided Road to Hana tour rather than choosing to drive yourself because we will show you the best stops along the way and it will be a stress-free adventure. Another thing you will most likely want to add to your itinerary no matter which island you choose is seeing at least one waterfall. There are beautiful waterfalls on Big Island, Maui, and Kauai. 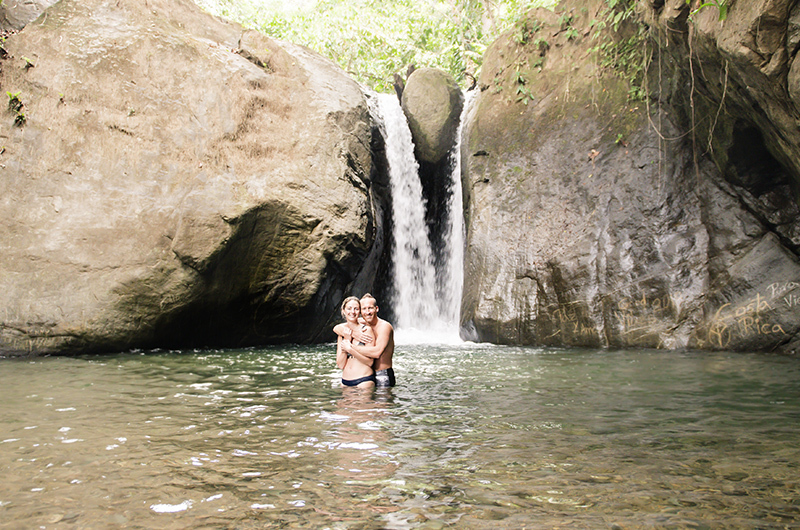 During our Big Island Zip n’ Dip tour, you can swim in the pool of a private waterfall. Also, on our Road to Hana tour on Maui, you have an opportunity to swim in a waterfall pool. All of the Hawaiian islands have tons of hiking opportunities for you to enjoy. Beach days are another thing you can bank on during your honeymoon in Hawaii because all of the islands have beautiful beaches. More and more couples are opting for a non-traditional registry for wedding gifts. Sites like Honey Fund and the Knot among others offer options to create a Honeymoon Fund or a Newlywed Fund. With these options, your guests can help you have an unforgettable honeymoon. You can specify which activities you and your future spouse are interested in doing and then guests can choose which activity they want to help fund. As an added touch to show your gratitude, you can snap pictures during each activity and send the activity photo with the thank you card so your guest can see how much you enjoyed their gift. The possibilities are endless! You can ask for a romantic dinner, help with the cost of airfare, a sunrise tour, a zipline tour, surfing lessons, a massage experience, or a Road to Hana tour just to name a few. Or, if you are not really sure which activities you want to do yet, you can ask for money that will go towards your overall honeymoon trip. Here is an example of what your Hawaiian honeymoon registry could look like. If you want to ask for a few more traditional registry items you can stick with the travel theme by asking for things like luggage, luggage tags, or travel size products.